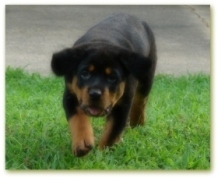 Caring for your Rottweiler puppy - Are you prepared for your new bundle of joy? 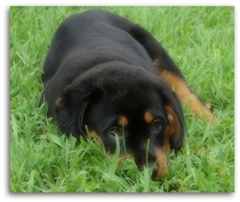 Rottweiler puppy care can really seem like a daunting task, but I'm here to help you. Are you the proud new parent of a little black & tan fur ball - Otherwise known as a Rottweiler puppy? CONGRATULATIONS!!! You'll find everything you need for your fur-baby right here. If you're just getting ready to bring your baby home, or are still looking for the right one, I'm sure you're excited. I know what that excitement feels like and quite frankly, I'm a little jealous - LoL.
. . . But, once you get that sweet little puppy home is when reality sets in. The better prepared you are ahead of time, the easier everything will be. This page will cover all the basics of caring for your new pup, including suggested supplies you're likely to need. First off, Rotties are not a dog that should be kept outside. Dogs are not solitary animals, especially Rottweilers. They are very much family dogs and love to be with their people. The most ideal arrangement is to get your puppy started right with her very own crate/kennel. And the ideal place to keep it is in your bedroom if you have the room. Rottweiler puppies, much like human babies often need to get up in the middle of the night to potty. If your baby is far away from you in the night, she will not be able to wake you up and let you know she needs to go out. Chances are pretty good that you'll have a mess to clean up in the morning. This is speaking from my own as well as others experience. 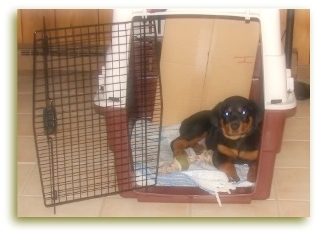 Crate training your pup right from the start makes everything easier, especially house-breaking. When you're shopping for a crate, keep in mind that your cute little fur ball is going to grow up to close to a hundred pounds. Now, I won't lie to you. . . crates are NOT cheap, and Rotties pretty much take the XL of everything. But, the best thing you can do is buy a crate large enough for an adult Rottweiler and block off 1/2 of it with something like a cardboard box, like Duke's dad did in the picture above. I'm often asked what style of crate works best. The cage style where they can see all around them, or the plastic ones that are more secluded. . . .or a variation of that type. My answer is the plastic secluded type or similar. The reason for this is that a puppy will begin to think of his crate as his little den. His quiet, safe and secluded area where he can relax. 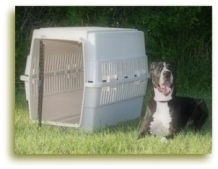 GR-Pet offers the Petmate Vari Kennel in XL size (pictured Left) that can actually fit a Great Dane for a pretty reasonable price. So the above is your basic run-of-the-mill dog crate, and will work great for your puppy as he grows into an extra large adult. But what if you don't like the look of that plastic in your house? Well, they actually make some pretty darn cool looking dog crates theses days. Of course they are more expensive, but they will last for a very long time, and if how your dog's crate looks in your house is important to you, then you're in for a treat. The Pet Super Store has the coolest collection of designer dog crates that can fit in and look great in any home. Some of them even become furniture, such as an end-table. Check out the picture below of some of the ones that I personally like. When it comes to puppy nails and puppy teeth, it might be a good idea to have a box of band-aids on hand as well. Those little needle sharp razors and talons can wreak havoc on your skin. Most dogs HATE having their nails trimmed, so the sooner you get your puppy used to having her feet handled and nails trimmed, the better. The good news is that trimming dogs nails is much easier these days compared to how it used to be. I use an electric rotary nail file, and it is so much better than the old guillotine style trimmers! The trimmer is simply a tiny little electric driven belt sander. It works just like a nail file that we would use, except it turns rather quickly and files down your puppy's nail a little at a time - NO BLOOD! The best way to get started is to hold and massage your puppies feet very often. Just randomly site down and mess around with his feet for no reason at all. This will keep him guessing that every time you touch his feet doesn't mean he get's a nail trimming. The Gentle Paws Nail Trimmer will not hurt him one bit. GRpet.com carries these for under $20 bucks, so they are a great bargain and work fantastic. It can tend to tickle a bit with the vibration though, so it does take some getting used to for your little one. It's best to have numerous short nail trimming sessions, and of course make sure your baby get's a yummy as soon as he was good and let you file down a nail or two. If you do this consistently, you will always be able to trim your puppies toes without any problems, and your life will be a lot easier for it - this I promise you! 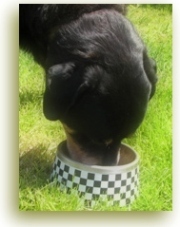 Proper nutrition for your Rottweiler pup is one of the most important things to consider. You have to consider that his little growing body needs the best food possible so that he can grow up to be a strong and healthy adult. You're likely going to need to switch your puppy's food from what the breeder and/or kennel was feeding. Unfortunately, most people feed a low quality kibble, although they're not aware of it due to big business advertising. Switching a puppy's food needs to be done slowly, to prevent stomach upset. When you bring your new puppy home, all the stress of the change in environment can take it's toll. To avoid puppy diarrhea, make sure to switch his food slowly over a 2 week period. Start by adding about a 1/4 of the new food to the old food for a few days, and then gradually add a little more new and a little less old every couple of days. This helps his digestive system get used to the new food slowly. Contrary to popular belief, puppies don't actually need to eat a puppy specific food. As long as it's high quality it certainly won't hurt them, but there's really no need for it either. Part of the fun of having or being a Rottweiler puppy is playing with toys :0) Let me tell you right now, to expect ALMOST every toy your buy your puppy to get destroyed! They really do make some pretty tough toys these days, but Rotties are capable of serious destruction. But, if you make sure your little one has plenty of her own toys to destroy, you'll lessen the destruction of other items such as shoes, clothing, furniture, etc. Toys are actually very important to training, because it teaches your pup that her toys are her very own, and it's ok to chew on them. . . .instead of your shoes! What are the best toy's for Rottweilers? The Tire Biter (my personal favorite). This is the ONLY toy that my boy Chevy has been unable to destroy over the years.Although my house didn't fare very well. The Kong (these are a favorite of most dogs). The Kong is actually a very tough toy, and versatile too. They work great for teeth strengthening, and when your puppy is teething. But you can also stuff treats or even peanut butter in them and keep your puppy occupied for quite some time. They also make them with ropes attached to them for easy throwing. I use the roped Kong for when I take Chevy to the lake, as it makes it a lot easier for me to throw. The ever popular Rope Toy - These are fabulous for playing tug of war with your Rottweiler puppy. But, keep in mind that it will get shredded in no time flat. You will also have to be very careful that your puppy doesn't eat the shredded rope. This toy should never be left with your puppy when you're not there to supervise.When your puppy starts teething, playing tug of war with a rope toy will likely end up pulling his teeth out. Don't be alarmed when you find puppy teeth on the floor, it's completely natural. Next to feeding and training your Rottweiler puppy properly, developing a good relationship with your veterinarian is the best thing you can do for your baby. Most dogs get really stressed out when they have to go to the doctor. who can blame them really, when they get poked and prodded, and things stuck in unmentionable places. It's a really good idea to take your puppy (if possible) to the vet on occasion just to weigh him and get a yummy treat, so that he doesn't start associating the vet with ONLY trauma. The better your puppy and your vet get to know each other, the easier it will be to keep your puppy healthy. Also, with Rottweilers, many vets are hesitant (which is unfortunate), so if your vet gets to know your dog from the time he's little, then there won't be any breed-related fear. The first trip you take to the vet will likely be for puppy vaccinations. The first 3 rounds of vaccinations are VERY important. Rottweilers tend to be more susceptible to Parvo than other breeds, so be sure to get the necessary shots before taking your puppy to too many public places.